On a hilltop in Arlington National Cemetery, servicemen from our nation’s wars, whose names we don’t know but whose service and sacrifice we will always remember, have found their final resting place in the Tomb of the Unknowns. It’s fitting that these courageous Americans, who represent all who have worn the cloth of our great country, received our nation’s highest military award, the Medal of Honor. In addition to these unknown heroes, for many of us Medal of Honor recipients, and for many veterans, Arlington National Cemetery evokes specific memories of incredible people we served with and long-ago battles we fought. 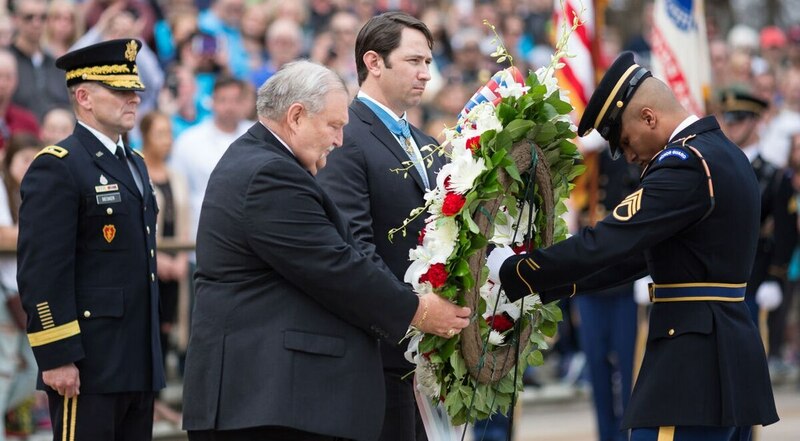 There are 71 living recipients of the Medal of Honor, and this week, 31 of my brothers are in our nation’s capital to commemorate National Medal of Honor Day, which falls every year on March 25. While they lay a wreath at the Tomb of the Unknowns and render salutes as a lone bugler plays “Taps,” all of us, no matter where we are, will be paying our respects to the men and women who have served our great nation in uniform. To a man, the privilege and burden of wearing the Medal of Honor is our opportunity to represent the soldiers, sailors, airmen, Marines and Coast Guardsmen who have served, fought, and in some cases sacrificed their lives to preserve America’s liberty. All 71 of us have witnessed firsthand the ravages of the battlefield. The medals will be presented at a ceremony at Fort Carson, Colorado, on Thursday. We all have one thing in common: We fought side-by-side with Americans from all walks of life. We wear our medals for all of them, and especially for those who didn’t come home. As Medal of Honor recipients, we have the opportunity to travel around the country and meet patriotic Americans striving every day to improve their communities and our nation. We understand you don’t have to wear a uniform for service or sacrifice. That’s why in 2008, we created the Citizen Honors Awards to recognize everyday Americans for their extraordinary acts of courage and selfless service. And that’s why we’ve made Citizen Honors a significant part of our National Medal of Honor Day commemoration. Individually, the stories of these heroic and selfless Americans are amazing and inspiring. Collectively, they’re an example for all of us to emulate. The 2018 recipients are no exception. Robert Engle subdued a gunman in a Tennessee church and prevented further loss of life. Matthew Cobos shielded and provided lifesaving medical treatment to concertgoers injured in the mass shooting at the Route 91 Music Festival in Las Vegas. Kimberly Scofi selflessly serves veterans in Georgia through her United Military Care organization, providing them with immediate access to food and housing. Virgil Smith, our Young Hero Award recipient, used an air mattress to rescue 17 people during Hurricane Harvey. The Veterans Heritage Project in Phoenix is receiving our Community Service Hero Award for a program that connects students with veterans to conduct oral history interviews that are donated to the Library of Congress. These stories are reminders that you don’t have to serve in combat or experience a life-threatening situation to make a difference in someone’s life. Sometimes doing the right thing may not have an immediate or obvious effect, but the long-term impact can be just as powerful for the person you helped. Courage, service and sacrifice come in many forms, and they all matter. Doing the right thing always makes a difference. My fellow recipients and I encourage you to take a few minutes on National Medal of Honor Day to reflect on the blessings we have as Americans and thank those who have willingly and selflessly served and sacrificed to protect our way of life, as well as those who choose every day to do the right thing. We also challenge you to help make your communities and our country better for everyone by embracing the values embodied in the Medal of Honor: courage and sacrifice, commitment and integrity, citizenship and patriotism. We believe there’s a hero in everyone. How will you make a difference? Drew Dix earned the Medal of Honor for his actions in South Vietnam’s Chau Doc province in 1968 as an Army staff sergeant; his citation, and those of other Medal of Honor recipients, can be viewed at The Hall of Valor Project. Dix is president of the Congressional Medal of Honor Society.